Is this for real? 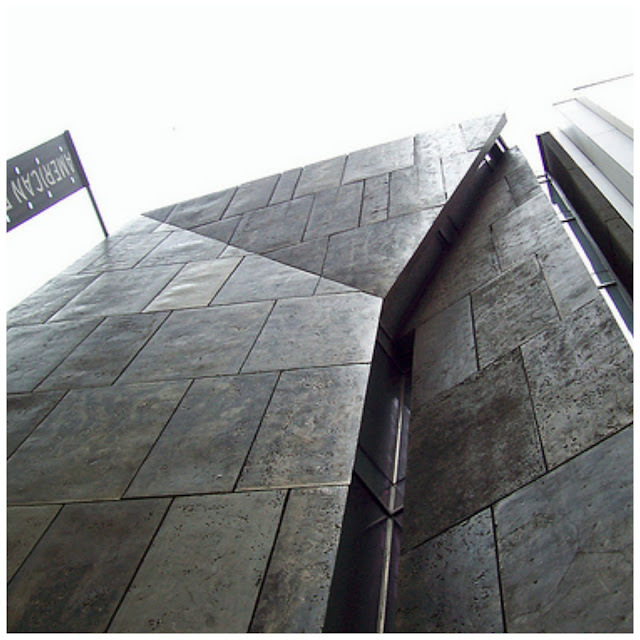 How can MoMA, an influential museum destroy a building that IS art? This is painfully wrong. The building's metal façade is a celebration of materials, a tactile and significant architecture...The texture of its metal panels came from casting the panels from sand molds taken from the texture of concrete. Its materiality informs craft, making a connection between the hand and the finished object. This is innovative thinking...How can MOMA be so insensitive, so unresponsive to a crafted building? 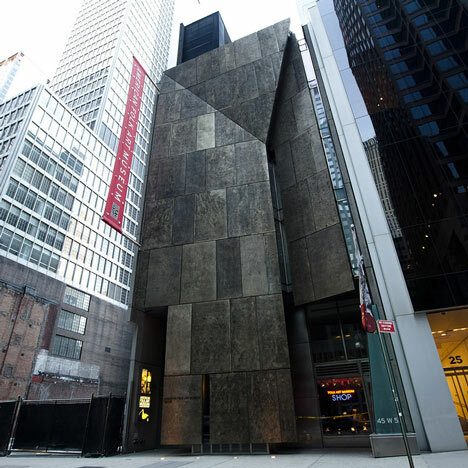 Why is MoMA so quick to condemn and not find alternate ways to preserve and integrate this folded modern façade into its existing building fabric? And most importantly, why wasn't there an open dialogue with Tod Williams and Billie Tsien to present solutions to integrate the two museums? Many of you are aware of the news of MoMA's proposed demolition of the American Folk Art Building on 53d street. As you may know I had the great fortune to serve as the project architect in Tod Williams and Billie Tsien's studio charged with managing the design and construction of this wonderful building. I hope you will join me in signing the petition which is circulating that asks MoMA to reconsider. I would be grateful if you might forward this email on to your contacts who may be able to help save the building. If there is any hope to reverse this decision (and there may not be), we need to send a strong message to MoMA's board and staff that this is a cultural betrayal, and a fundamentally flawed act. In the short time since the news release yesterday, the press has spoken and some of the most esteemed critics of our time have lambasted this unfortunate decision. Even from a pure economic "efficient" business viewpoint (as MoMA proposes), it makes little fiscal sense to purchase a building for $32 million, demolish the $18.3m existing state-of-the-art space, only to replace it with restaurants, retail, and less exhibition space at a likely cost of more than $40 million more dollars! The City of New York and many prominent donors gave this award winning building intended as a public space for New York City. This demolition marks true hubris, an absolute waste, an unsustainable vision, and a loss of one of the most adored buildings in NYC. Here are some links: Perhaps the most compelling is Martin Filler's blistering condemnation. The New York Times broached the topic. The WSJ reported this morning with an interview with Tod and Billie. Ned Cramer, editor of Architecture Magazine, wrote an immediate opinion that laments the news. Paul Goldberger has made a series of compelling critiques on Twitter . Architectural Record reinforces this consensus in an erudite dismissal of the proposed demolition. Justin Davidson on Vulture writes with equal dismay at the planned erasure. The internet is alive with myriad blogs and chat rooms all incredulous at this unfortunate turn of events. The news marks a sad day for New York and for Architecture and it sends the wrong message from an institution the world admires. It goes against the very principles of what Museums are meant to stand for: a responsibility to preserve our culture and, in this case, award winning contemporary architecture. There is no question in my mind that the Folk Art building with its 14,000 square feet of exhibition space could provide a compelling complement when well connected to MoMA's existing galleries - it is in fact perfectly suited for art experienced at a more intimate scale - a scale that Taniguchi's galleries at MoMA simply can't embrace. Works on paper, graphic and industrial design, architectural drawings and models (the Mies Archive) would all show extremely well in the Folk Art Building. Please sign the petition and forward this email on to your friends. I hope we can reverse this and I appreciate your help. Lets do all we can and come together as a design and architectural community and sign the petition noted above! Lets SAVE the American Folk Art Museum!